To plan a workflow process, you must identify all of the activities and transitions for your entire workflow process. You must determine, from the start of the workflow process, how the next activity will be selected and transitioned. You will determine how transitions should branch to other activities based on the result codes of a completed activity, and then establish the order of execution. You will decide who needs to be notified and who needs to respond. You also must identify attributes needed for all of the activities and determine where the values of the attributes will come from. There are three type of activities: process, notification, and function. Transitions can be based on the specified result code of an activity. For example, once your user has created a PO, you will want Oracle Workflow to send a notification to your user’s manager. The notification will include PO information and ask the manager to either approve or reject the PO. The approval or rejection will be sent back to the user as a notification. If the manager does not respond within the time-out period, a time-out notification will be sent to the user. 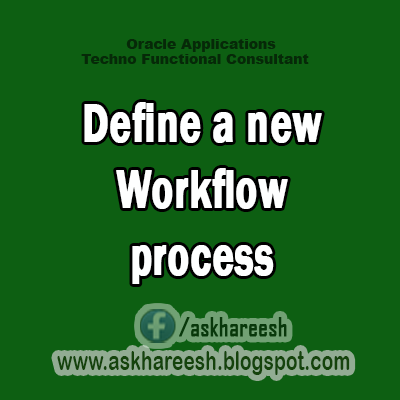 Every workflow process should have a start and an end function. The start and end functions for the Standard item type is necessary only for visual purposes. In this particular PO approval process, you will need a function activity to find the appropriate manager, and you need four notification activities. One notification activity informs the manager that there is a PO waiting for the manager’s approval. This notification must solicit a response and will therefore have a respond attribute of Lookup Type and a lookup type of Approval. Another notification informs the user that the manager approved the PO (the manager selected Approve as the response). A third notification informs the user that the manager rejected the PO (the manager selected Reject as the response). The final notification reminds the manager that he or she has not responded in a timely manner and must respond ASAP. Once the manager approves or rejects the PO, the PO status must be updated. You will need a function to update the PO. During planning, it is best to list all of the activities, prerequisites, and steps. and ask for response again. Manager approves or rejects PO.